In 1885 George Bird Grinnell took a hunting trip in what is now northern Montana. Touched by its beauty, Grinnell called the area the “Crown of the Continent.” He then spent the next 20 years instituting the area into a national park. Years later in 1910, the area would become Glacier National Park making it the 10th national park in the United States. Located in Montana, Glacier National Park provides over 1 million acres of beautiful land for exploration. Bordering Alberta and British Columbia, the park includes over 700 lakes, sections of two separate mountain ranges and has over 700 miles of trails for hiking. Alongside the beautiful scenery, you can find Glacier National Park lodging, many of which were built in the early 1900s. As of today, nearly 350 of the Swiss-styled buildings in the park have been placed on the National Register of Historic Places. With so much land to explore, Glacier National Park has more than enough opportunities for discovery not limited to hiking. These include wooden tour boats that date back to the ‘20s and the Red Jammers from the ‘30s — restored White Motor Company coaches. Glacier National Park is also amongst one of the best places for fly fishing in North America. Though it is known for the Going­ to­ the­ Sun Road, Glacier National Park holds other majestic places for wandering. From the North Fork to Hidden Lake and Triple Divide Pass, to Chief Mountain and Grinnell Glacier, the park holds endless chances for visitors to experience a truly astonishing place. Glacier National Park is also home to a wide variety of wildlife. In 2008, roughly 300 grizzly bears were living in the park. Among the grizzly, the wildlife in the park includes the Canadian lynx, black bears, wolverines, mountains goats, elk, moose, bighorn sheep, coyotes, mountain lions, river otters, badgers, mink, fish, and so much more. Glacier National Park is a definite must for anyone seeking a breathtaking adventure. Like Rising Sun, the Swiftcurrent Motor Inn & Cabins offers Motel rooms and Cabins. These affordable rates are great for hikers wanting to visit the Many Glacier areas. At the foot of the beautiful Lake McDonald in West Glacier’s Apgar Village is the Apgar Village Lodge Cabins. These modest in-park lodging accommodations include both motel rooms and cabins, which are not only affordable but conveniently located to a variety of popular activities in Glacier. Motel Lake McDonald is located in the same proximity as Lake McDonald Lodge, along with the eastern shores of Lake McDonald inside Glacier Park. This motel is a great choice if you are looking for value accommodations inside the park! The Prince of Wales Hotel offers historic elegance surrounded by magnificent mountain peaks and the tranquil, turquoise waters of Waterton Lake and is sure to be the highlight of your vacation. For easy access to Glacier National Park and the surrounding attractions, in a beautiful Historic setting, the Belton Chalet is ideal for guests wanting a special experience with charming hospitality, and natural beauty in the encompassing scenery. The ideal destination for a couple seeking a quiet and clean Glacier getaway, as this is a pet and smoke-free facility that does not accommodate small children. Opening in 1932, Saint Mary Lodge and Resort has served as the perfect location for those that are traveling on the east side of the park. The lodge is also a great stop for visitor's before they enter the park and make their way over Going to the Sun Road. Glacier Park Lodge is in a great location in the town of East Glacier on the Blackfeet Indian Reservation and offers a rich history of the park and the Blackfeet Indian People. Glacier National Park is known for its beautiful vistas and pristine mountain peaks and what better way to take in those views than from the front porch or your own cabin? St Mary / East Glacier KOA is minutes from the eastern entrance of the park and offers well-appointed log cabins, beautiful views and top-notch amenities including full kitchens, swimming pool, restaurant and much more. With an ideal location and a variety of cabin styles, St Mary / East Glacier KOA is an ideal choice for couples, families and large groups looking to explore the Crown of the Continent. Glacier Highland Motel offers a superb location right outside the western entrance to the park, providing clean, comfortable accommodations with a long list of amenities and delicious on-site dining. Moss Mountain Inn is a stunning, 3-story chalet style B&B situated on 6 acres within the Flathead National Forest and only 7 miles from the west entrance of Glacier National Park making it the perfect option for those looking for an alternative to a lodge and beautiful, serene views. Stanton Creek is fun for all ages and pet friendly! Enjoy this historic, convenient location around 20 minutes from East Glacier! Glacier Haven is a family operated facility, centrally located for easy access to explore both sides of Glacier National Park. Guests are family at Glacier Haven and you will be treated with friendly care in a cozy and comfortable setting. Located in Essex, Montana, the Halfway Hotel is conveniently situated on Highway 2 approximately halfway between West and East Glacier. The Halfway Hotel offers travelers the perfect price for newly renovated rooms with great proximity to the park. Glacier Cabins offers comfortable accommodations in a great location, nearby many popular local activities and only ten minutes from Glacier Park. The Great Bear Inn only accommodates 24 guests at a time it is the perfect destination for the Glacier bound explorer wanting a pampered experience. The Country Inn & Suites by Radisson is one of the newest constructed lodges in the area, conveniently located next to the Glacier Park International airport and only 25 miles from Glacier National Park. The lodge offers all the comfort and amenities you would expect from a Radisson property including indoor pool/sauna, fitness center, business center, outdoor patio with a firepit, rooftop patio, complimentary hot breakfast, and each room features beautiful views of the Rocky Mountains. The Pine Lodge is located in Whitefish, MT right along the Whitefish River. This is a great choice if you are looking to enjoy the park and the attractions of Whitefish Resort. The Lodge at Whitefish Lake is located in the resort town of Whitefish right along the eastern shores of Whitefish Lake and only moments from the downhill ski and summer resort. Located in downtown Whitefish, the brand new Firebrand Hotel is situated near several popular restaurants, shops, and attractions including golf, hiking trails, Whitefish Lake, and the Whitefish Mountain Resort. 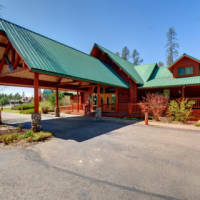 The Best Western Rocky Mountain Lodge provides comfortable, well-equipped accommodations in a great centralized location in Whitefish, Montana. Located in Whitefish, Montana, Baymont by Wyndham Whitefish offers quality and comfort to their guests in their newly remodeled rooms, the added convenience of a free breakfast with every stay, and the leisure of an indoor pool and outdoor hot tubs. Kandahar Lodge offers modern comfort and style, with a great location on Whitefish Mountain, providing pristine views of the Flathead Valley and a bevy of family-friendly activities. Kandahar Lodge offers seven room type garret, hotel rooms, studios, lofts, kitchen lofts, two room suites and the executive suite. There is no elevator and all rooms require some stairs. The vacation homes and condos at Whitefish Mountain Resort provide the comforts of home along with easy access to the resorts many family activities. The Holiday Inn Express Suites Kalispell is an excellent choice for travelers who desire the entire experience of the Flathead Valley and Glacier National Park area. The Red Lion Hotel provides guest with all they need for a great vacation to Glacier Park. Red Lion is the place to stay in the Kalispell, with comfort, excellent amenities, and many attractions just a short drive away. The Hampton Inn in Kalispell offers an experience of comfort and charm in their numerous guestrooms and suites, which are supplemented by exceptional service for their guests and a prime location in relation to many area attractions including Glacier National Park. The Hilton offers high-class luxury for all of its guests including well-adorned guest rooms, wonderful dining options for each meal of the day and it serves as a great home base for exploring all of the nearby attractions. Meadow Lake Resort offers a variety of recreational opportunities and activities right on the property, including an 18-hole world-class golf course. Located in Columbia Falls, the Meadow Lake View Bed & Breakfast is just minutes away from the west entrance of Glacier National Park. The location combined with its friendly hospitality makes this B&B the perfect getaway for couples. Guests are also treated to a gourmet breakfast each morning made with the freshest ingredients of the season and area. The brand new, pristine Cedar Creek Lodge is the perfect home base for those visitors who want to explore both Glacier National Park and all Whitefish has to offer.